Meatballs, that is. My husband loves, loves this dish. He smiles, even giggles as soon as I say it’s on the stove. 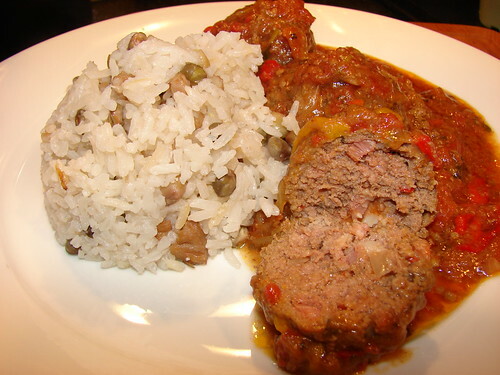 Albóndigas are the Latin American version of the Italian meatball. This dish, like most dishes with a pan sauce or gravy, improves overnight. All the flavors get to hang out, know each other and get happy. That doesn’t mean you have to make it ahead, just make enough to have some leftovers and have everyone in your office drool over your lunch. 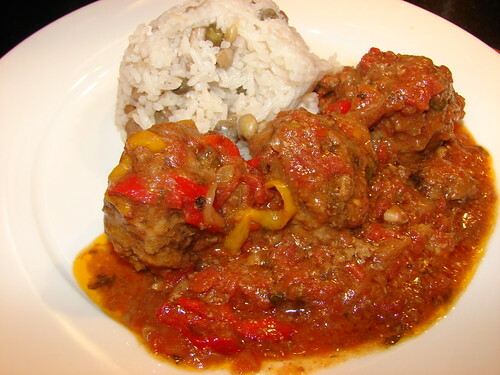 The albóndigas are moist and flavorful as they are helped by the addition of bacon and seasonings. Then they’re simmered in pan drippings and beer on the stove top, leaving you with a light sauce that you can pour over your rice. 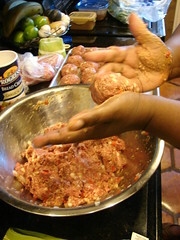 Preparing the meatballs ~ Combine the ground beef, bacon, onions, garlic, bell peppers in a bowl and set aside. In another bowl, beat the egg, add ketchup, salt, black pepper, Maggi and mix thoroughly. This will allow the condiments to be mixed evenly when you add it to the meat. 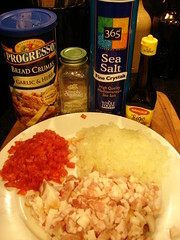 Once you have combined the meat and seasonings, making sure it is all well incorporated, mix in the bread crumbs. You are now ready shape the albóndigas. I like making them rather large-a little larger than a golf ball-you can make them as large or as small as you’d like. However, keep in mind that the fat from the beef and bacon will cook down, so don’t make the meatballs too small. This amount of beef will make about 15 meatballs. You want to use a pan with a tight-fitting lid, once you’ve shaped your albóndigas, heat up the pan. 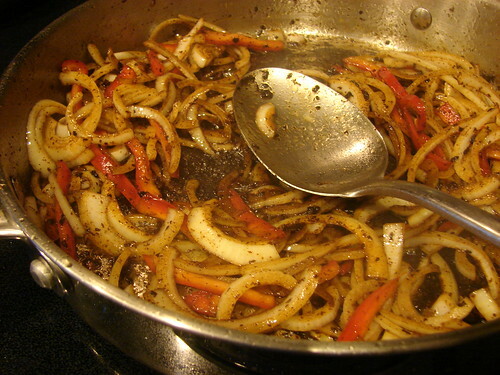 Add about 1 tsp of oil to the pan and spread it around the bottom using a paper towel or brush. Gently place the balls in the pan, don’t crowd them. You need enough room between them to be able to turn them. When the meatballs are browned on all sides, remove them from the pan and set aside. You may need to brown them in 2 batches. Some of the fat from the meat will have been rendered on the pan, add the onions and bell pepper and cook until the onions begin to get translucent. Add the tomatoes, garlic and parsley and stir; you may have some dripping at the bottom of the pan, don’t be afraid of these, they hold all the flavor from the meat. The moisture from the tomatoes will make it much easier to incorporate the drippings. Add the habanero sauce and beer. 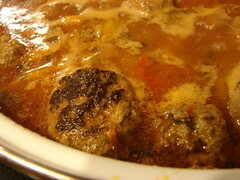 You need to have enough sauce to cover the albondigas; adjust your seasonings if necessary. Bring the sauce to a boil, then add the meatballs, spoon some of the sauce over the top of them. Cover and reduce heat to medium and allow it to simmer for 35 minutes. Do give them a stir every once in a while, you want to make sure they albondigas are absorbing the flavors from the sauce. Remove the lid and allow it to cook for another 10 minutes. The meatballs will be fully cooked by now, what you’re doing at this point is reducing and thickening the sauce. Listo! They’re ready to serve over rice. I usually serve these with white or yellow rice. 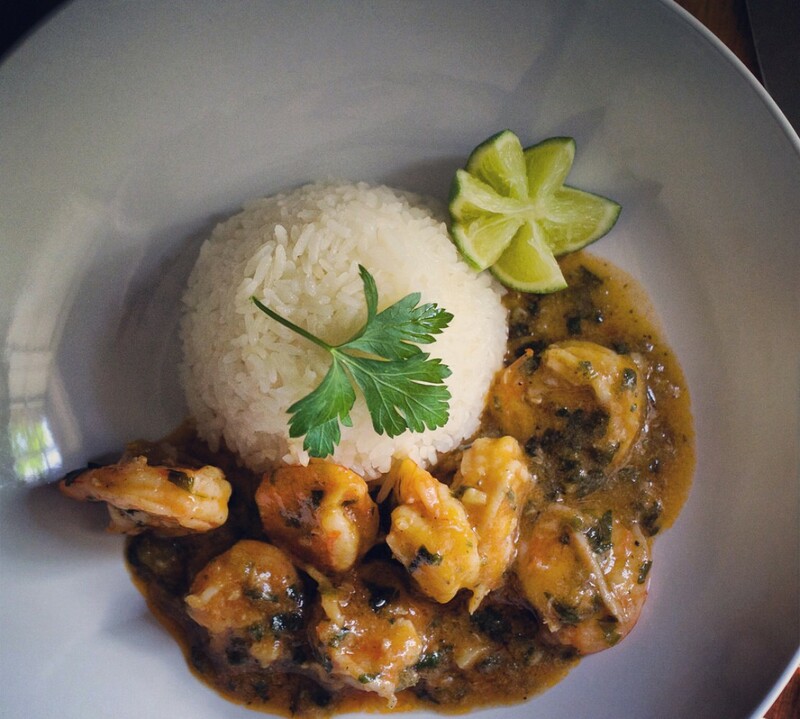 The last time I made them I served them with Arroz con Guandú; a very traditional dish in Panama. Follow the link for that recipe. I hope you’ll enjoy this dish as much as we do, don’t forget to let me know how it turns out. I’m gonna try this recipe next. OMG… I can almost taste it right now. Heavenly.. I made these for dinner. It was a big hit. We dont really eat ground beef so I used two parts ground turkey one part ground beef. It turned out great though. LOVED IT.